For months, Jim Burns, Roderick Spilman, and I had talked about going to the Upper Arroyo Seco to cast a fly and see if any rainbow trout had survived the devastation of the Station Fire of 2009. We had spoken with Tim Brick of the Arroyo Seco Foundation and he expressed interest in any rainbow trout sightings within the Arroyo Seco system. After a couple of significant rain events, our schedules magically aligned, and we scheduled a date certain for our expedition. On Saturday, we arrived at Switzer in the San Gabriel Mountains at around 10:30 in the morning. A heavy mist hung in the air and the threat of rain was imminent. My son, Ansel (12), joined us for the adventure. Jim was armed with a nice 3-wt. fiberglass fly rod, Roderick had his trusty 3 wt., and Ansel and I had taken our 4 foot, 2 inch Redington Form game rods — novelty practice rods that actually work great in tight quarters. We also had a small pair of scissors and a container in which to keep any DNA samples we might collect. As we walked, a thick, wet mist bathed us in dew, and we wondered if we had been unwise to leave the rain ponchos in the Jeep. Sometimes at home or even hiking, my kids and I practice casting for fun and accuracy. I cast for a while as I hiked –- sans fly. 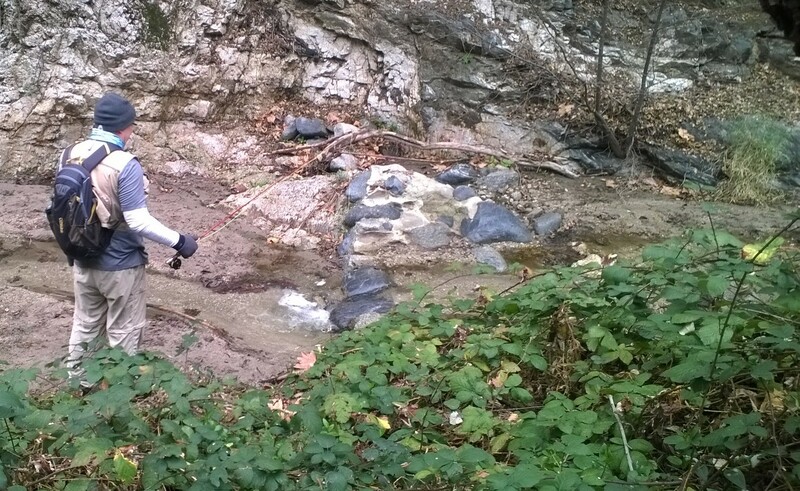 As I hiked and cast, I imagined the river as it was –- the Arroyo Seco before the fire. Ever since I can remember, I have lived near the lower reaches of the Arroyo Seco and hiked its many trails and canyons. Even today I live off of the Millard tributary. I have fond memories of stalking rising trout since the days of my youth. I would pack a lunch, grab my 3 wt. fly rod, my mountain bike, and head out for a day on the river. I always brought a supply of barbless Elk Hair Caddis and Griffith’s Gnats, my go-to flies for the system. The Arroyo Seco was rarely large water, and remained a skinny stream most of the year. During periods of high rain, the river would rise dramatically, but usually there were times and places where the river would retreat underground, only to re-emerge. I welcomed the wildness of the forest, and listened to the wind in the trees and the gurgling of the brook. Sometimes, I would see brightly shining trout circling each other around the red submerged roots, so entranced in their mating dance they would not notice me. Occasionally, a trout would break the mirror stillness of a nice pool. These were wary fish and the larger ones generally took up residence in bridge pools, large undercuts, the dam pool, or sometimes, small, yet deep, pocket pools. This was really fishy water from the headwaters of the Arroyo Seco below Red Box, down to the lower portion of the Arroyo Seco above JPL. I had a chance to fly-fish many sections of the Arroyo Seco, or to spy a trout holding in the stream as I shot by on a mountain bike. It is amazing to think that before the Devil’s Gate and Brown Mountain Dams, large steelhead even swam in these tributaries. At first we talked and laughed happily, enthralled at the excitement of our quest and the impending discovery of large holdout rainbow trout. As we walked, our gaze trained on the river. Not a single pool to be seen. All features of the river have been erased. Tons and tons of sand and pebbles filled the area that had once provided great habitat for fish. Saturday, the stream was a rapid, narrow band of water that descended in a straight line toward the sea. As we walked on, our spirits remained up, but short pockets of silence punctuated our hike. I think during these times, we each may have contemplated the reality that there were likely no fish in this part of the system. We stopped atop the falls and ate our sandwiches, trail mix and tangerines. Roderick went on a quick, exploratory scouting mission to ensure that we were not missing any incredible pools just beyond the next bend. He returned a while later with the news that the creek looked the same beyond the falls. After lunch, we packed up our trash and headed back to the waiting Jeep. As we approached the car, we agreed to salvage the rest of the day by wetting a line on the L.A. River. After all, I had found a promising new spot I wanted to check out. 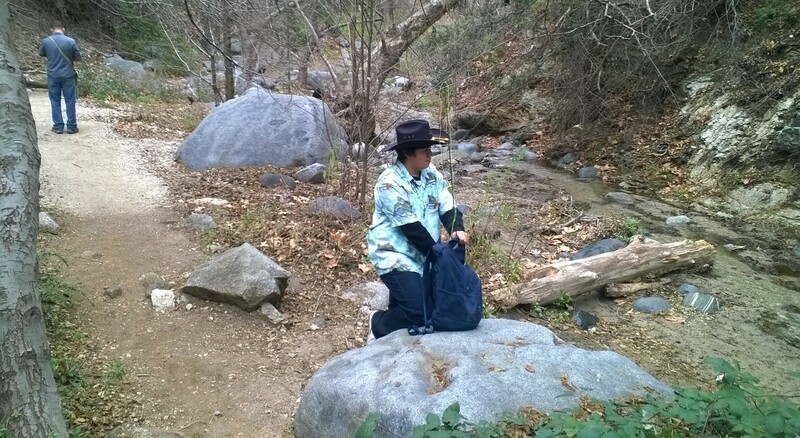 Although this expedition had not turned up any rainbow trout, we had enjoyed a fun adventure and still remain hopeful they may exist somewhere in the Arroyo Seco system. It is incredible how much devastation the Station Fire and the record rainfall that followed it did to the Arroyo Seco system. Massive walls of mud, burned logs and debris made their way down the river, destroying everything in their path. While there is a certain resilience in nature, it would appear some things cannot undo themselves … at least for the time being. Yet, I fervently hope that there, unseen by us, among submerged twigs and rocks, swim the next generation of rainbow trout – waiting for the protective embrace of dusk to emerge for their nightly insect feast. Everything former pool is filled with sand. I mean, every former pool is filled with sand. It’s sad that there are no fish there at the Arroyo Seco, but it’s still a beautiful place to hike and explore nature! Thank you for sharing your adventure with us. After reading it, I felt like I was there! Thanks for the article Roland. The song says that mountains tumble to the sea, and that process is accelerated by the fire. The good news is that there’s some fish up there somewhere, hanging out, and waiting for the natural revegetation and winter rains that will scour and rebuild the complexity that trout need. You are a friend of the River….. Thanks so much for your scouting report, Roland. It’s not only the fire but the severe drought conditions of recent years that have devastated the conditions up there. As well as Brown Canyon Dam and the lack of any fire-recovery measures post-Station Fire. Keep looking please, and pray for rain! Have you been here recently?? Not since last year, but we will take another look sometime after El Niño subsides. If you go, please share what you find.